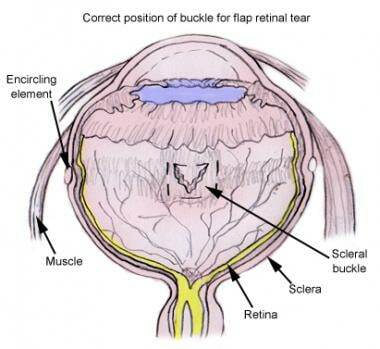 A scleral buckle is performed to repair a retinal detachment by reestablishing the anatomic proximity of separated retina from its underlying tissue. An acute retinal detachment is an ophthalmologic emergency that can rapidly progress to irreversible vision loss in the affected eye. The neurosensory retina depends on its underlying layers (the retinal pigment epithelium and choroid) for delivery of oxygen, trophic factors, and nutritional substrates. Therefore, any damage or disruption in the conduit between the layers has great potential to lead to ischemic damage and cell death. The vast majority of detachments are caused by the formation of tears (rhegma) in the retina, which allow the entrance of liquefied vitreous into the subretinal space, leading to subsequent separation of the neurosensory retina from the underlying retinal pigment epithelium. The principle of scleral buckling is based on the need to collapse the anatomic space created between the detached sensory retina and the retinal pigment epithelium. This is done by the inward indentation of the sclera from the exterior, creating a ridge (or buckle) that reduces the fluid underneath the tear and allows for the re-apposition of separated layers, thus reestablishing their physiologic connection. The sclera itself is most commonly indented by placement of a permanent explant or intrascleral implant with sutures, although temporary buckles have been used in variations. The external indentation from the buckle explant reduces the volume of the globe, and in doing so relieves a portion of the vitreous traction contributing to the retinal tear and detachment. Although this procedure involves exposure of the globe and considerable intraorbital manipulation, it is most often performed on an outpatient basis. In addition to the placement of the explant to displace the eye wall inward, it is important that the retinal tears are sealed by the formation of chorioretinal adhesions. This is performed by inducing a chorioretinal scar via cryotherapy, diathermy, or laser energy. In conjunction with the generation of such adhesions, the physical closure of the break by the explant/implant enables the attachment of the retina. The dynamic forces that generated the detachment (vitreoretinal traction and inflow of liquefied vitreous) are thus countered by these maneuvers. Although modalities such as vitrectomy and pneumatic retinopexy are increasingly used to manage retinal detachments, buckling continues to be an important and useful approach in many clinical scenarios. In addition to the placement of scleral buckles as a primary and solitary procedure, they are often used in combination with pars plana vitrectomy in order to address complicated retinal detachments and provide further support. Given the poor visual outcomes that attend the course of an uncorrected detachment, scleral buckling is most often performed on an emergent to urgent basis, especially in the setting of macula-sparing detachments. The most common mechanism causing retinal detachments is the formation of rhegmas or full-thickness tears in the retina. Rhegmatogenous detachments account for 90% of detachments, resulting from the traction exerted on the retina by the posterior vitreous. As the rhegma forms, liquefied vitreous is allowed access to a pathway into the subretinal space. It subsequently acts as a wedge to separate the neurosensory retina from the retinal pigment epithelium. Detachments may be due to dialysis, in which the retina detaches circumferentially from its insertion point at the ora serrata on the retinal periphery. This is a less common etiology and is most often seen in the setting of trauma and in young patients. Detachments that emanate from breaks anterior to the equator (the anterior-posterior circumferential midpoint of the globe) are more amenable to placement of buckles. Breaks significantly posterior to the equator are anatomically more difficult to approach owing to hindrances from the bony orbit and poor surgical exposure. As such, posteriorly located breaks are best addressed with vitrectomy. Opaque media may preclude visualization of retinal tears and thus proper discovery of all the breaks. This is most often seen in scenarios of vitreous hemorrhage, such as in the setting of severe retinal neovascularization due to diabetic retinopathy. In patients with significant vitreoretinal traction, such as with proliferative vitreoretinopathy and diabetic neovascularization, using a scleral buckle exclusively is usually insufficient to reattach the retina. However, buckling may be used as part of the surgical approach in addition to vitrectomy. Many surgeons prefer to avoid possible anterior ischemia caused by buckling in patients with vaso-occlusive disease, such as sickle cell anemia and, to a lesser extent, severe diabetic retinopathy. If subretinal drainage is used, it is important to avoid retinal incarceration into the drainage tract. The most crucial aspect of any approach to treating rhegmatogenous detachments is the ability to localize and account for all the retinal tears. Failure to locate and treat a tear would predispose any technique to failure because it allows for the new influx of subretinal fluid. When placing a primary buckle, this is performed with intra-operative indirect ophthalmoscopy via the aid of a condensing lens, typically a 20- or 28-D lens. The use of scleral indentation to bring the peripheral retina into view is necessary in order to achieve full visualization. Initially, full visual acuity testing should be performed to assess the patient’s baseline level of vision. This is crucial in the primary care or emergency department setting. A drastically reduced visual acuity may be an indication of macular involvement and thus may lessen the need for a more urgent intervention. However, even macula involving detachment are best repaired within 7-10 days for optimum visual acuity recovery. Extraocular muscle testing is important to establish a baseline because strabismus may develop postoperatively. Tonometry is indicated because retinal detachment frequently lowers intraocular pressure. Postoperatively, buckling may increase intraocular pressure as a function of volume reduction. As such, it is important to establish any history of glaucoma. Laboratory tests, as guided by the medical history, may be requested as part of the preoperative evaluation. Coexisting systemic diseases may increase anesthetic and surgical risks, as well as the potential for local complications (eg, thrombocytopenia). Postsurgical visual outcomes are related to the extent of initial macular involvement. Anatomic reattachment is achieved in close to 90% of cases. However, there may be a significant discrepancy between favorable anatomic correction and functional visual outcomes. The sensory retina, composed of photoreceptors and adjacent ganglion cells, overlies the retinal pigment epithelium. The blood supply for the sensory retina is derived from two circulations, both originating from the ophthalmic artery. The anterior circulation comes from the retinal artery as it branches into arterioles that course along the surface of the sensory retina and supply the inner (more proximate to the vitreous) layers. Changes in this circulation are seen with vitreous retinopathy, most commonly in patients with diabetes, who are predisposed to tractional detachments. The posterior (uveal) circulation supplies the outer segments of the retina (the photoreceptors and the retinal pigment epithelial). It is the loss of contact with this supply that proves disastrous in the course of detachment. The peripheral edge of the retina is defined by the ora serrata, the junction with the ciliary body located anteriorly. In this region, the inner and outer retinal layers are tightly adherent. The sclera is the protective outer covering of the eye composed of fibrous connective tissue. It has the structural integrity to support the placement of an explant. The sclera itself is contained within the Tenon capsule, which merges anteriorly with the conjunctiva. These two structures must be penetrated to place the buckle. For more information about the relevant anatomy, see Retina Anatomy. Sleeve, encircling, and buckling elements. Scleral buckling may be performed under either local or general anesthesia. Retrobulbar local anesthesia with sedation may be used. However, some surgeons routinely use general anesthesia for buckling owing to pain and discomfort associated with manipulation of the recti muscles. Retrobulbar blocks often do not sufficiently anesthetize the posterior insertion of these muscles. General anesthesia is almost always used in pediatric patients. Often, a block is also performed to augment general anesthesia. There are two principal approaches to administration of local anesthetic: retrobulbar block or peribulbar block. With retrobulbar block, anesthetic is injected posterior to the globe into the retrobulbar space. The most concerning risks of retrobulbar injection of anesthetic are the potential for retrobulbar hemorrhage, optic nerve damage, injection of anesthetic into the subarachnoid space, and perforation of the globe. With peribulbar block, anesthetic is introduced more anteriorly, outside of the muscle cone surrounding the globe. This reduces some of the risks associated with the more posterior injection necessary in the retrobulbar approach, such as penetration/perforation of the globe, optic nerve damage, and retrobulbar hemorrhage. Both of these techniques provide both sensory anesthesia and akinesia of the rectus muscles. A mixture of bupivacaine (0.75%) and lidocaine (2%) is the most commonly administered local anesthetic for both approaches. This provides both a long-acting anesthetic (bupivacaine) and a short-acting agent (lidocaine). Epinephrine should be avoided given the risk of central artery occlusion that exists with resulting vasoconstriction. Patients are positioned in supine manner on an eye bed with the head flat, and placed under the operating room spotlights. Patients should be seen the next day to assess for emerging postoperative complications, such as choroidal detachment, high intraocular pressure, or persistent retinal detachment. Further follow-up varies, performed approximately at postoperative weeks 1, 4, 8, 12, and 30, with annual examinations afterward, or as dictated by a complicated postoperative recovery. Patients may have increased myopic refractive error due to axial lengthening of the globe. Macular edema and macular pucker may cause worsening vision several days after surgery. After anesthetic is administered, the eye is prepared and draped in sterile fashion and a lid speculum is placed. A conjunctival peritomy is made and the conjunctiva is reflected back using forceps and Westcott scissors. A relaxing radial incision is often made at the horizontal meridians to prevent tearing of the conjunctiva. A 360° peritomy is usually made, but a smaller incision may be made if the culprit tear is localized to a single retinal quadrant. The Tenon capsule is then dissected bluntly using Stevens scissors and similarly reflected back from the insertion point of the rectus muscles. Cotton applicators or other means to bluntly push back are also frequently used. The four rectus muscles themselves are isolated with muscle hooks and secured with sling sutures (2-0 to 4-0 silk sutures), as shown in the image below. Isolation of rectus muscles with sutures. The most crucial aspect of any approach to treating rhegmatogenous detachments is the ability to localize, characterize, and seal all retinal tears. Not locating a tear would predispose any technique to failure because it allows for the continued influx of subretinal fluid and the promotion of the detachment. The initial survey is performed through indirect ophthalmoscopy via the aid of a condensing lens (20 or 28 D). To view the peripheral retina, it is necessary to indent the sclera to bring more anterior breaks into the viewing field. This task becomes significantly more difficult in the setting of opaque media, such as cataract, vitreous hemorrhage, or exudates. As a result, if the retina cannot be reliably visualized, the operator cannot be confident that all tears and areas of degeneration are identified. In this case, vitrectomy should be considered. The location of the breaks may be marked on the sclera with the use of a localizer (eg, marking depressor, diathermy probe). Tears are preferentially marked at their anterior edge, which is the area with the most vitreoretinal traction that must be opposed. Care must be taken to only depress the sclera, not the shaft, with the tip of the localizer. Otherwise, false localization may result in erroneous buckling. A marking pen may be applied over the initial mark to make it visible for longer time, as shown in the image below. Localization of rhegmatogenous retinal break with probe and condensing lens. Cryopexy of a particular region is ceased once the ice ball is seen (using indirect ophthalmoscopy) to involve the retina to avoid progression to necrosis. The retinopexy applications should be contiguous surrounding the tear but not overlap considerably, as this may cause excessive damage to the tissue. There should be 1-2 mm of treatment extending past the edge of the break. The explant or implant material is made from either hard silicon rubber or silicon sponge material. These come in a variety of shapes and sizes that allow the surgeon to tailor the buckling amount and distribution of pressure to each case. The decision to place the buckle element over intact sclera or within an intrascleral pocket is made by the vitreoretinal surgeon based on experience and judgement. Intrascleral implants require scleral dissection and add to the duration of the surgery but decrease the risk of extrusion of the buckle element. When choosing a buckling element, the primary factor is the number and location of the breaks. The patient’s phakic status, presence of glaucoma, and any comorbid diseases should also be considered. The rationale of employing an encircling approach is that it allows for numerous seen and unseen breaks to be buckled, thus preventing the intrusion of vitreous that maintains the detachment. Many surgeons prefer to use encircling buckles because of their higher success rate over segmental buckles. Encircling also favorably changes the geometry of the globe by alleviating vitreoretinal traction. The buckle elements are soaked in an antibiotic solution and then placed underneath the rectus muscle. Securing scleral sutures (5-0 polyester with spatulated needle) are placed parallel to the buckle with partial thickness depth. Care is taken not to perforate the globe with the suture needle, which should be spatulated. The previously placed marks localizing the tears on the sclera are used to decide where to secure the buckle. It is important that the buckling element extends past the posterior edge of the break. The sutures may be released and buckle repositioned accordingly. At this juncture, the operator may decide to extend the procedure and include drainage of subretinal fluid if indicated (see images below). Depending on the size of the tears, depth of the detachment, and associated vitreoretinal pathology, the operator may choose a degree of height for the buckle or amount of indentation. Placement of encircling buckling element around eye. 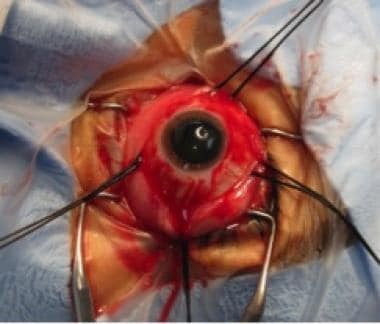 Placement of buckling material beneath retinal break. If drainage is thought to be preferable, the temporarily secured buckle is loosened to allow access and drainage is performed via a sclerotomy beneath the fluid collection. This site should ideally be covered by the buckling element afterward so as to prevent egress of further fluid. 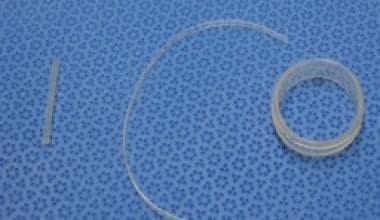 The actual entry and drainage can be performed with a 27- or 30-gauge needle. Some surgeons perform the drainage while inspecting the retina through indirect ophthalmoscopy. 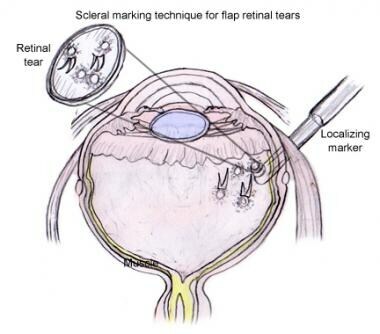 Other surgeons prefer to do a cut-down on the sclera to reach the choroid, which is cauterized prior to draining. If a nondrainage approach is chosen, it may be necessary to counter intraocular pressure elevation via medical or surgical means (eg, anterior chamber paracentesis). This situation is more likely in cases for which encircling bands were employed, given their higher potential for volume reduction. Significant intraocular pressure elevation may be emergently reduced by either systemic osmotic therapy with 20% mannitol or surgical paracentesis (drainage of the aqueous humor from the anterior chamber, although this only temporarily reduces the pressure). Michels RG. Scleral buckling methods for rhegmatogenous retinal detachment. Retina. 1986 Winter-Spring. 6(1):1-49. [Medline]. Abrams GW, Garcia-Valenzuela E, Nanda S. Retinotomies and Retinectomies. Ryan SJ, Ogden TE, Hinton DR, et al, editors. Retina. 4th ed. St. Louis, MO: Mosby; 2005. 136. Schwartz SG, Flynn HW. Primary retinal detachment: scleral buckle or pars plana vitrectomy?. Curr Opin Ophthalmol. 2006 Jun. 17(3):245-50. [Medline]. Seider MI, Naseri A, Stewart JM. Cost Comparison of Scleral Buckle versus Vitrectomy for Rhegmatogenous Retinal Detachment Repair. Am J Ophthalmol. 2013 Oct. 156(4):661-6. [Medline]. Rush RB, Simunovic MP, Sheth S, Kratz A, Hunyor AP. 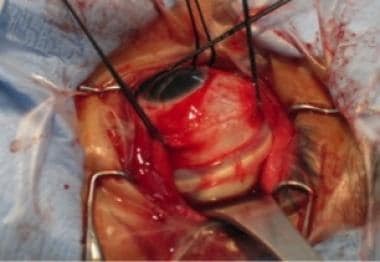 Pars plana vitrectomy versus combined pars plana vitrectomy-scleral buckle for secondary repair of retinal detachment. Ophthalmic Surg Lasers Imaging Retina. 2013 Jul-Aug. 44(4):374-9. [Medline]. Tani P, Robertson DM, Langworthy A. Prognosis for central vision and anatomic reattachment in rhegmatogenous retinal detachment with macula detached. Am J Ophthalmol. 1981 Nov. 92(5):611-20. [Medline]. Yang CH, Lin HY, Huang JS, Ho TC, Lin CP, Chen MS. Visual outcome in primary macula-off rhegmatogenous retinal detachment treated with scleral buckling. J Formos Med Assoc. 2004 Mar. 103(3):212-7. [Medline]. Wilkinson CP. Visual results following scleral buckling for retinal detachments sparing the macula. Retina. 1981. 1(2):113-6. [Medline]. Girard P, Karpouzas I. Visual acuity after scleral buckling surgery. Ophthalmologica. 1995. 209(6):323-8. [Medline]. Bhagat N, Zarbin M. Repair of Retinal Detachment with a Scleral Buckle. Dunn J, Langer P. Basic Techniques of Ophthalmic Surgery. San Francisco: American Academy of Ophthalmology; 2009. 46. Salvanos P, Navaratnam J, Ma J, Bragadóttir R, Moe MC. Ultra-widefield autofluorescence imaging in the evaluation of scleral buckling surgery for retinal detachment. Retina. 2013 Jul-Aug. 33(7):1421-7. [Medline]. Thompson JT. The effects and action of scleral buckles in the treatment of retinal detachment. Ryan. Retina. 4th. Philadelphia: Mosby; Chp. 117. Williams GA. Scleral Buckling Surgery. Yanoff M, Ducker J. Yanoff and Ducker: Ophtalmology. 3rd. Philadelphia: Elsevier; 2008. Garcia-Valenzuela E, Abdelsalam A, Eliott D, Pons M, Iezzi R, Puklin JE. Reduced need for corneal epithelial debridement during vitreo-retinal surgery using two different viscous surface lubricants. Am J Ophthalmol. 2003 Dec. 136(6):1062-6. [Medline].